1] The more I work with peg looms and weaving sticks, the more in awe of their creative potential I am and the more that I love weaving with them. I loved peg looms and weaving sticks before I began this book, which is why I worked so hard to find a publisher for it (YAY Stackpole Books!) 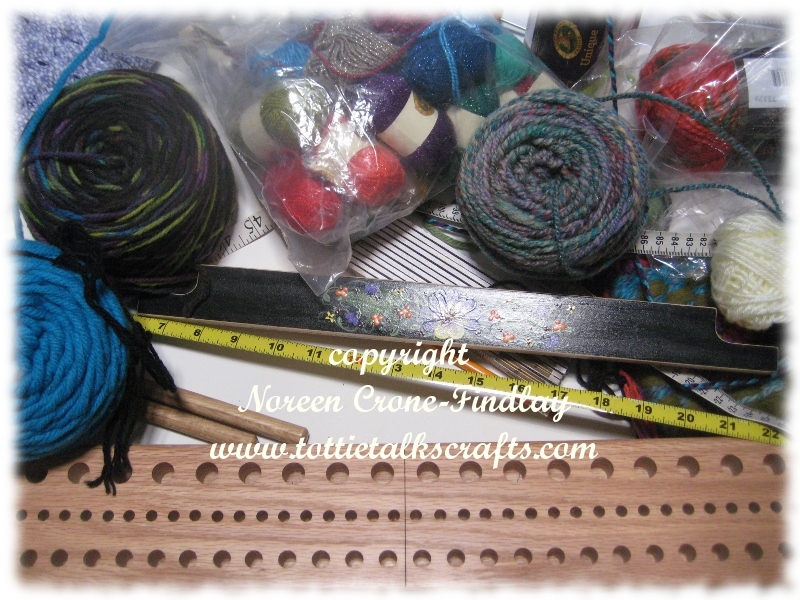 and what has become deliciously obvious is that I am more and more in love with peg looms and weaving sticks! AND, I am just thrilled with all the techniques and possibilities that I have come up with for the book. I have realized that there is so much more to explore with peg looms and weaving sticks that as we downsized and moved into a MUCH smaller house (*don’t do that when you are writing a book! *) I was quite happy to give away, long term loan and sell all my larger looms- but I could never sell or give away any of my peg looms or weaving sticks. 2] Working with the makers of weaving sticks and peg looms is absolutely amazing- Donna and Gary McFarland of Dewberry Ridge Looms , Lynette Richter of Daisy Hill Handiworks and Dennis Riley of Daegrad Tools has been PURE JOY! When I recommend these wonderful loom makers, I do so with a full and happy heart. They make BEAUTIFUL looms and are incredibly responsive and generous with their time and energy- they love what they do, and it shows in the looms that they make. You can’t have a weaving book without yarn, so I am REALLY grateful to them for their generosity. Bless their hearts! 4] It has been soooooooo exciting to design and make the projects for the book and in making them, to figure out neat ways of making the weaving sticks and peg looms do things that I had never imagined possible when I first began my voyage of discovery with peg looms and weaving sticks about 15 years ago. I am looking so forward to seeing what people come up with when they read the book and are playing with these ideas. The projects in the book may not speak to everyone, but I am hoping that the techniques that are used in the projects will ignite and inspire creativity! 5] And, now, I have to get back to work! Oh my word, I have a a gigantic ‘to-do’ list to work through in the last couple of weeks before I submit the manuscript! eep!